Wait, wait, wait. How could I possibly “revisit” a place I’ve never been to before? 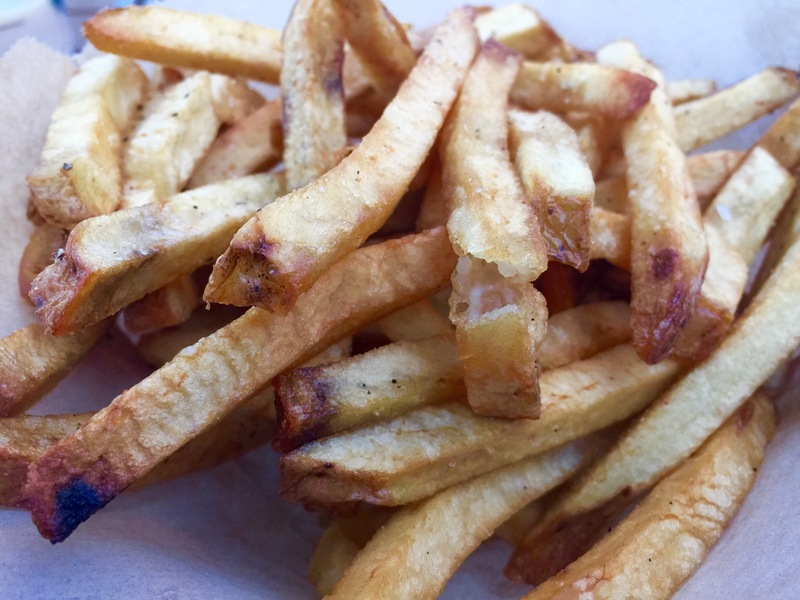 Well, if you’ll recall, some time back I reviewed Portola Valley Lobster Shack. The parent (or sister, brother, uncle, etc.) company of that restaurant is actually Old Port, and so really what I’m doing here is visiting a second Old Port location. So long Sbarro, hello Old Port. As a reward for my mall meanderings, I was corralled into Valley Fair’s newly renovated food court for a bit of lunch. Gone are the days of crappy fast food burgers, cardboard pizza, and stir fried alley cat. The new food court is filled to the brim with excellent upper-middle-range food options which, in mall terms, is like hitting the lottery. And hey! 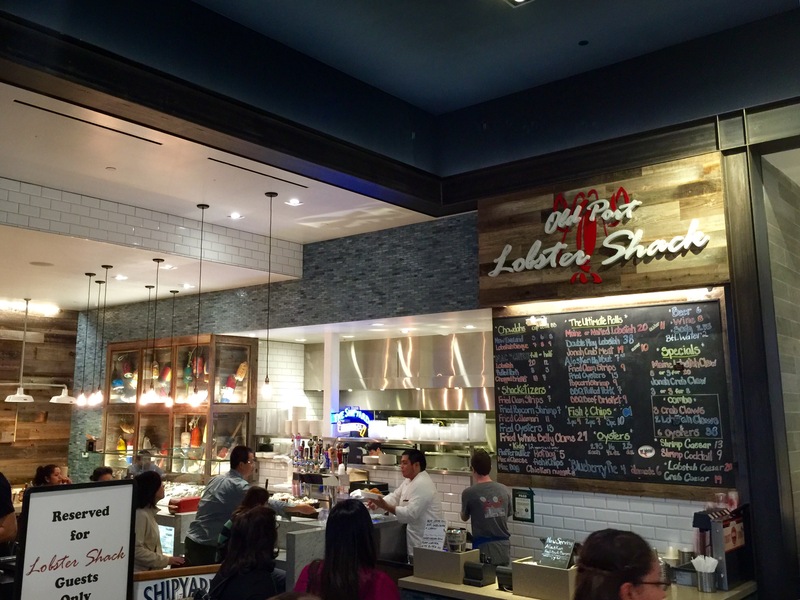 Over there, in the corner – it’s Old Port Lobster Shack. Lunch is served. I don’t understand why restaurants do this. Bread does not need to be shiny. We ordered some brisket mac & cheese and a fried popcorn shrimp roll, found a table, and waited. After only ten minutes of watching a toddler gleefully dismember an Avenger action figure, our food was ready. I picked up the brisket mac and the pulled pork sandwich and walked back to…. Waaait a damn minute. Pulled pork? Let me see that receipt again… Crap. It says pulled pork. I guess I mumbled when I ordered. Well, no matter, everything they make is good. We didn’t feel like sitting around for another ten foodless minutes, so we just went ahead and ate. 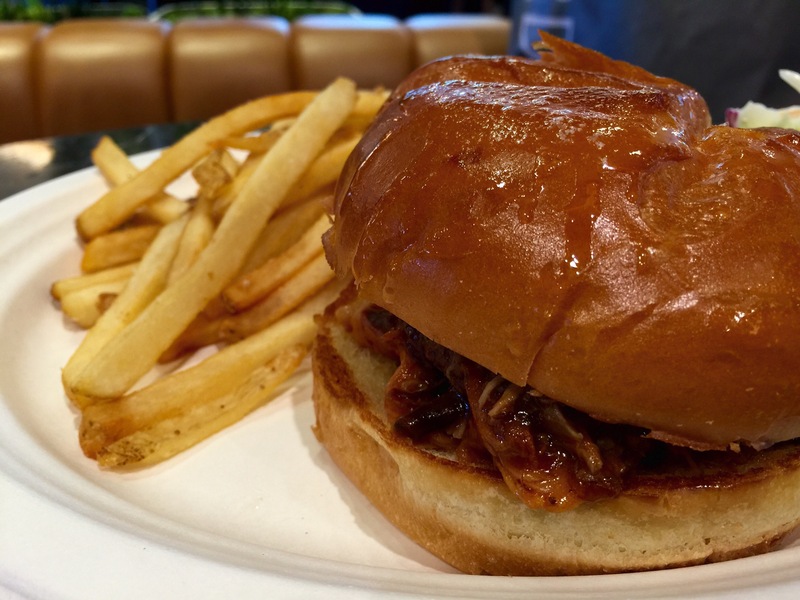 The pulled pork sandwich was, as expected, top notch. And, unlike all other mall food I have experienced in my life, it was freshly made and absolutely piping hot. 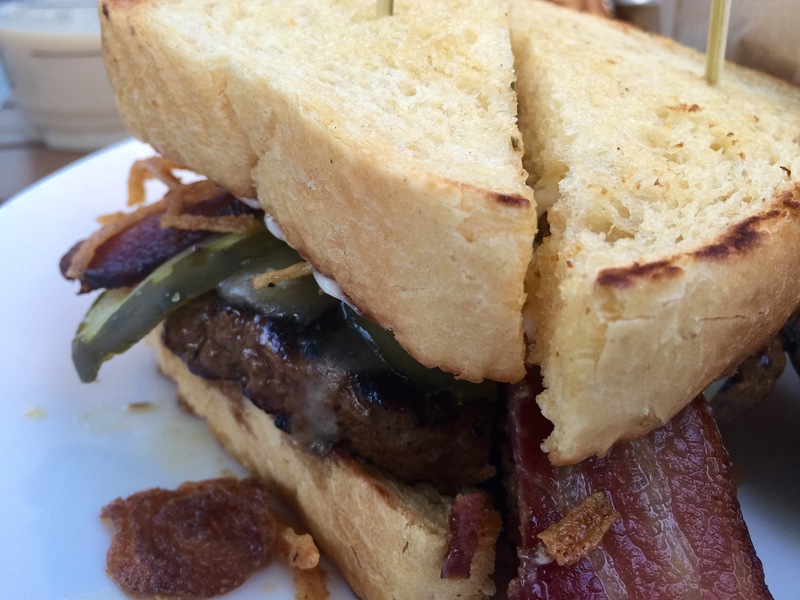 The bun was disturbingly oily, or perhaps it was clarified butter, but that’s just me being picky. It was all very tasty in any case, oil and all, and I had no true complaints. 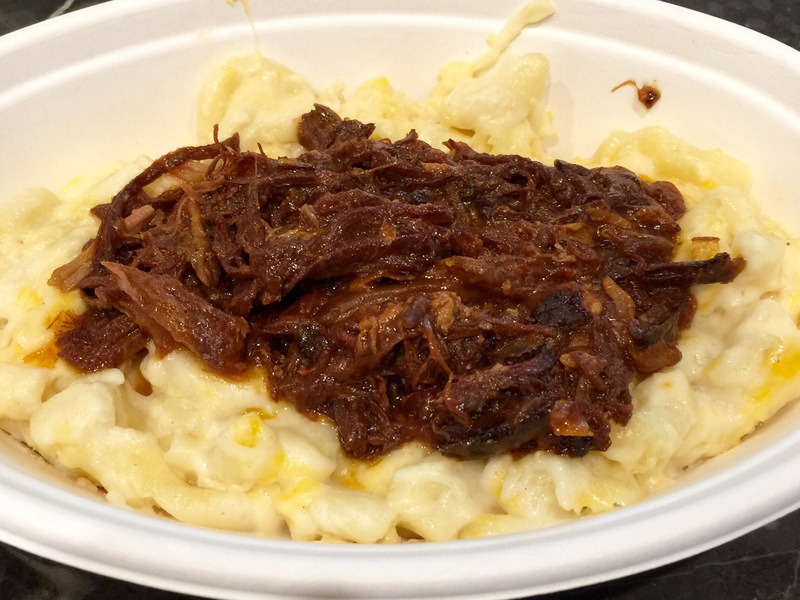 Mac & cheese & brisket. What more could you ask for? The mac & cheese was unfortunately a little more pedestrian than what I had previously experienced in Portola Valley. I don’t mean to imply that I didn’t enjoy it, because I most certainly did, but it didn’t have the crispy baked edges and toasty cheese topping like mac that is truly baked. To be fair, I can’t really expect that out of a kitchen running in “mall prep” mode. The quality that Old Port manages to crank out in this setting is excellent, so they get a pass on this one. In spite of a couple very minor setbacks, my previous rating of 35,098,552,670,980 flavor molecules for Old Port Lobster Shack stands. 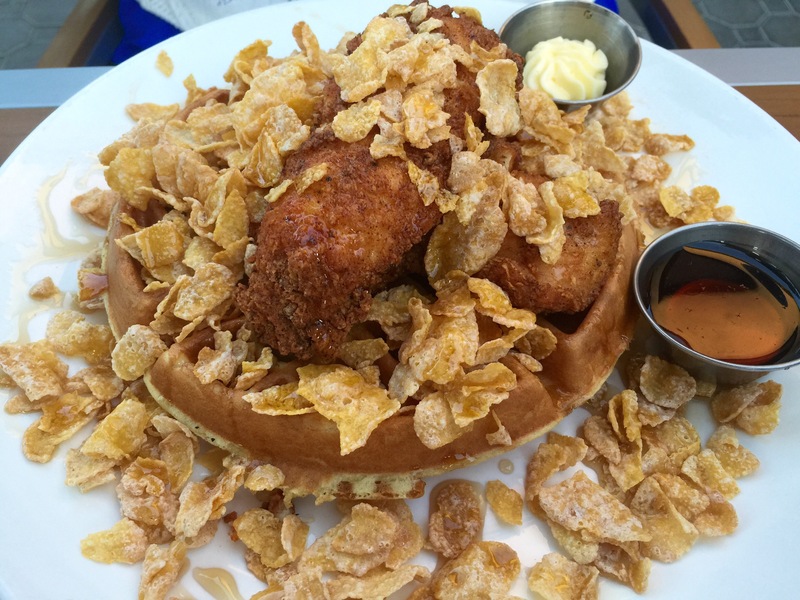 It’s a squarely above average eatery with truly tasty grub, now available in a crowded mall near you. Definitely pay this place a visit when you have a chance (along with the rest of Valley Fair’s new food court), but for the sake of your own sanity don’t go during peak hours. 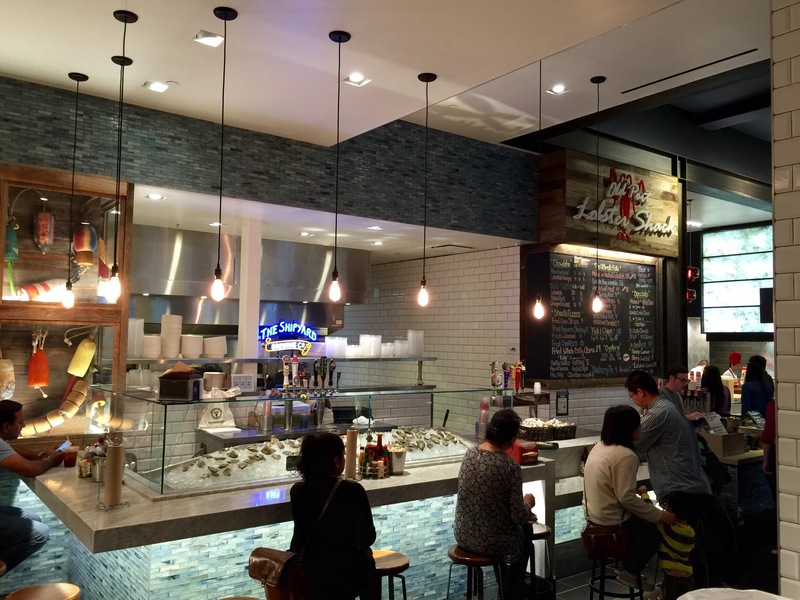 When was the last time you saw an oyster bar in mall? Yeah, me either. Everybody thinks they know how to make chili. Some people do, some people don’t. Both types of people are fine, but what many of them fail to understand is that real chili is not supposed to have beans. 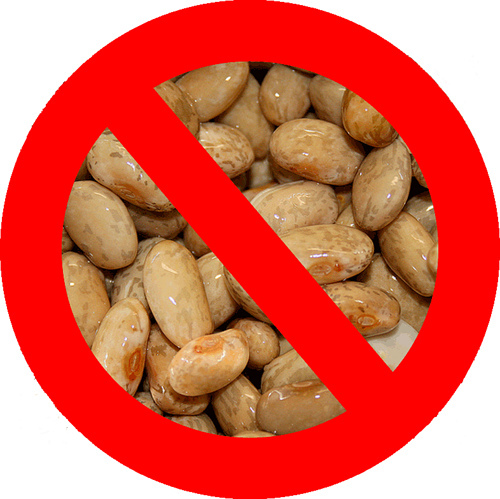 Now before you go all bean-militant on me and accuse me of being a bean hater, let me be perfectly clear: I love beans. I love beans in chili. 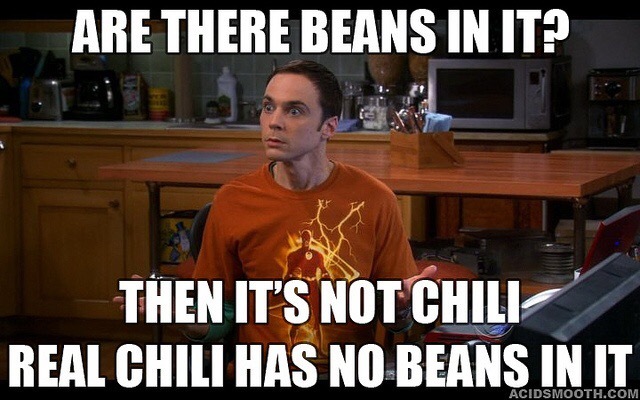 But beans are not supposed to be cooked in chili. The correct way to do things is to the cook beans separately and then add them to the chili on a per-serving basis… just like pasta. You don’t boil raw pasta in sauce, do you? No. You prepare pasta separately in its own pot of salted water so that it comes out just so, and then you add your pasta sauce to it. And that’s how chili is supposed to be handled as well. Chili is defined by the International Chili Society as any kind of meat or combination of meats, cooked with red chili peppers, various spices and other ingredients, with the exception of BEANS and PASTA which are strictly forbidden. 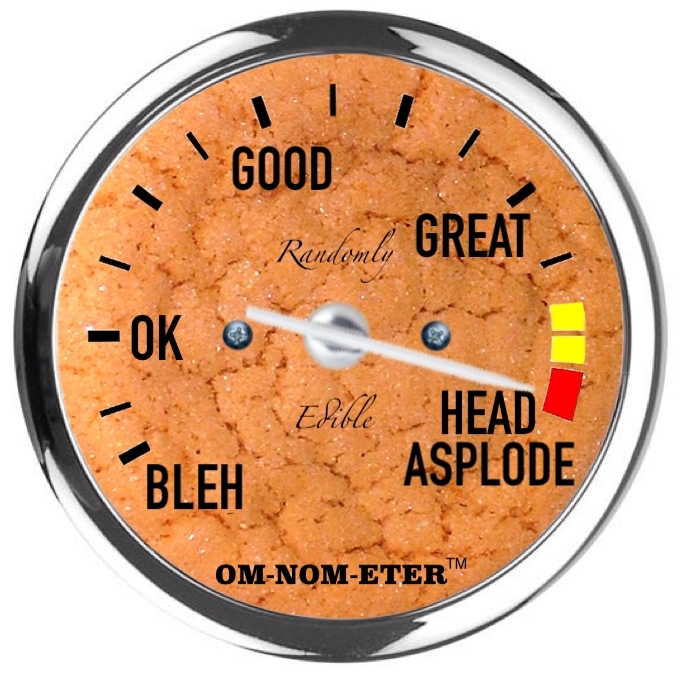 I already know what you’re going to say: “But… but…. I make famous and awesome chili and it has beans in it!” No, I’m sorry, you make famous and awesome chili-style beans. That’s ok though, it’s totally fine. There’s nothing wrong with what you make, you’ve just been calling it the wrong name. Before you get all huffy about it, I’m not here to tell you what you can and can’t do. You can make chili with toothpaste and pine needles if you feel like, and you can call it whatever you want. Just know that true, legitimate chili consists of exactly two things: meat and flavor. That means “vegetarian chili”, by definition, isn’t. At this point you might be wondering if you’ve ever really had true, legitimate chili in your entire life, and the truth is there’s a good chance you haven’t. Not to worry! The winning recipes from every World Chili Champion from 1967 to today are posted right here for you to replicate and enjoy. If you can’t decide which one to try first, Tarantula Jack’s recipe is both delicious and easy, and it’s a perfect example of what true chili is supposed to be. And for the sake of all that is good and wholesome in this world, serve the beans on the side. Please? 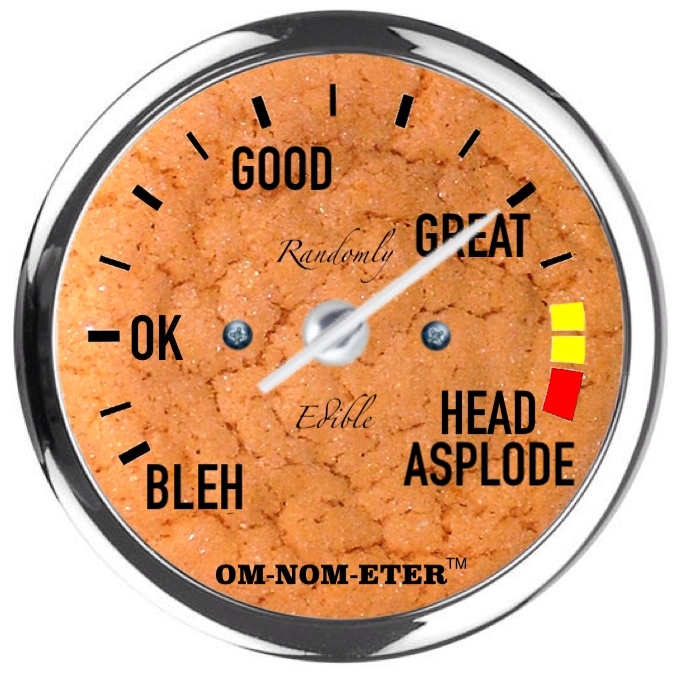 This graphic pretty much says it all. The views and opinions of the author are strictly correct and expressed as fact. If you find yourself in disagreement with any statements made in this post, stop smoking crack. Please also do not get your feelings all hurt because you just found out you were wrong about the bean thing. We all make mistakes. I once owned several pairs of tapered jeans, for example, but I stopped wearing them. Similarly, you can stop putting beans in your chili. A friend recommended this Maui hotspot to me more than two years ago, and it’s taken me all this time to finally try it for myself. Frequent readers of my blog (my thanks and condolences to you all) know that I have a thing for sketchy food served on the side of the highway, so I’m sure you can imagine my excitement to visit this truck. In spite of nearly 800 days of anticipation, I was not disappointed in the slightest to experience Geste Shrimp for myself. 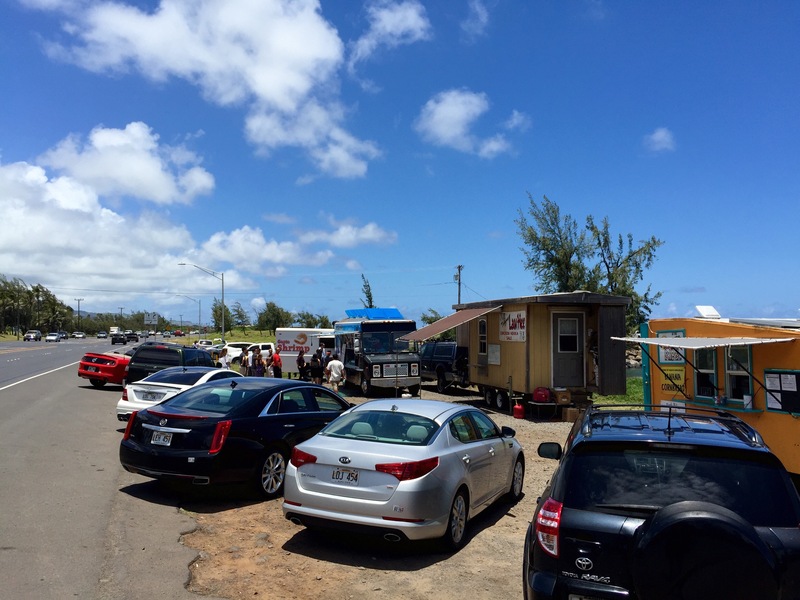 Within 45 minutes of touching down on the tarmac at Kahului Airport, my wife and I were on the backroads of Maui, headed straight towards Geste Shrimp. After a couple of wrong turns in the industrial part of town, we finally spotted a cluster of cars stopped on the side of the highway. We parked amidst half a dozen food trucks and trailers and looked for the one with all the people hanging around it. Yep, there was Geste. It sure wasn’t much to look at – nothing more than a drab white box with a window cut in the side of it – but that didn’t have much effect on our appetites. We headed over to that side of the dirt lot and got in line. The menu at Geste Shrimp is short and mostly devoid of useful information. 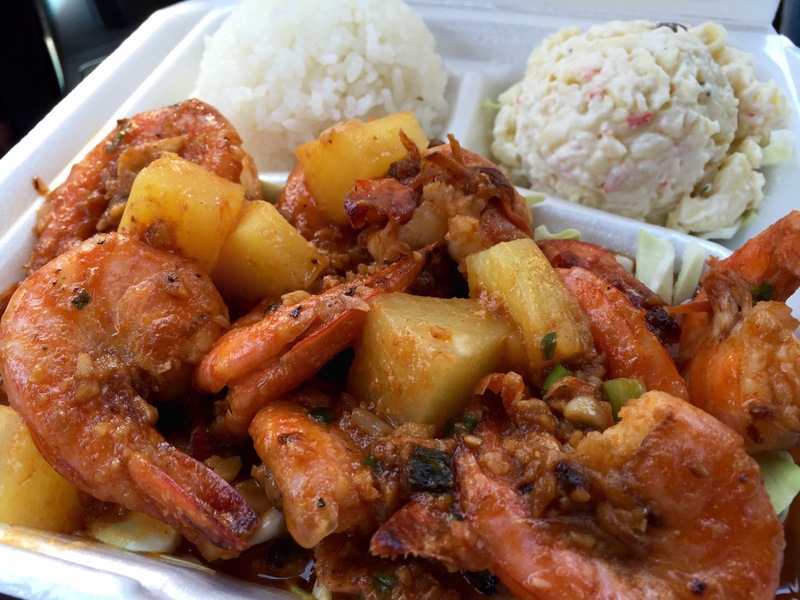 We decided on spicy pineapple shrimp and placed our order. The soft-spoken and patient cashier explained that we would need to wait for about twenty minutes, and we were ok with that. Everybody else seemed fine hanging around waiting and besides, we were on island time. Nobody gives a crap how long anything takes when they’re in Hawaii. This is my kind of tourist attraction. The wait was slightly annoying but bearable, and before long our order was called. The cashier handed me a Styrofoam container, two forks, and a HUGE stack of napkins through the dingy, cramped window. Shawn and I went back to the car, bemused at the enormous pile of dead trees we’d been given, and opened up the container. Three things were immediately apparent: 1) This was no typical food truck meal, 2) our rental car was never going to smell the same again, and 3) we were going to need a lot more napkins. The generous helping of shrimp and pineapple chunks were absolutely swimming in an even more generous lake of wickedly seasoned butter. We plastered the car and our clothes with napkins, precariously perched the brimming food container on the center console, and started peeling shrimp. There is no way mere words can explain how good this tastes. Oh. My. Goodness. That flavor. 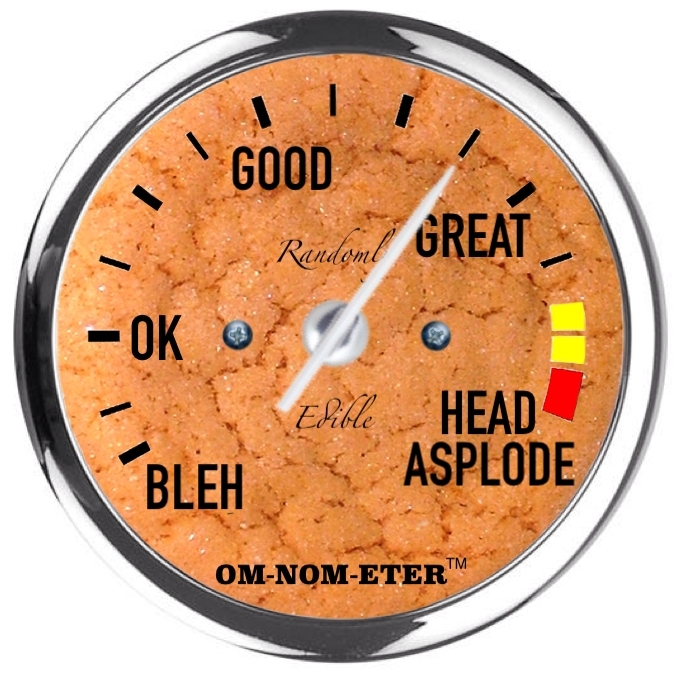 Fortunately for us, week-old garlicky seafood odor is not explicitly called out in Hertz rental contracts, otherwise we’d be purchasing a brand new interior for a Kia Optima. And that, boys and girls, is reason number 783 for not ever buying a used rental car. Randomly Edible, bringing you restaurant reviews, recipes, and automobile buying advice. 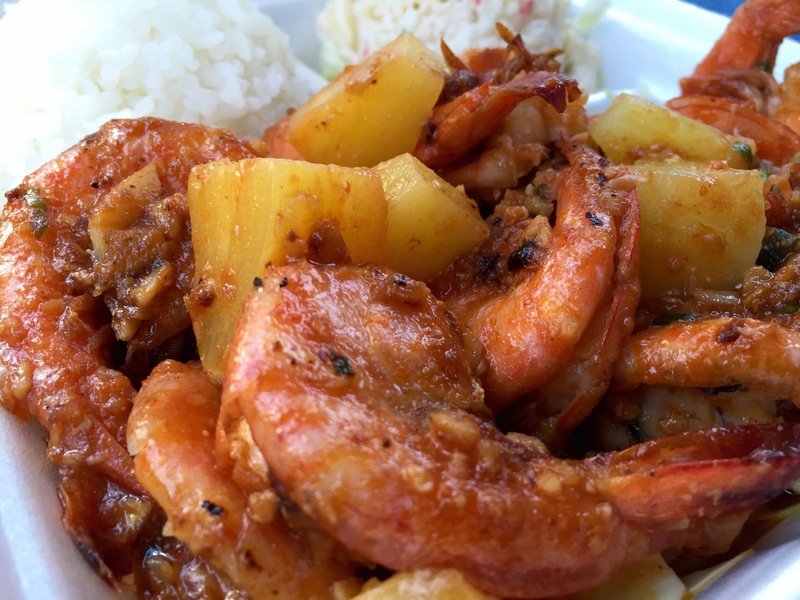 Just like that, Geste Shrimp made the number one spot on our tastiest-meals-of-the-trip list. It might be the very best shrimp dish of any kind I’ve ever had, and it was certainly the messiest. Everything was amazing about the meal, even the crab macaroni salad and the sticky rice. Twenty minutes was no time at all to wait – we would have been fine with twice that. 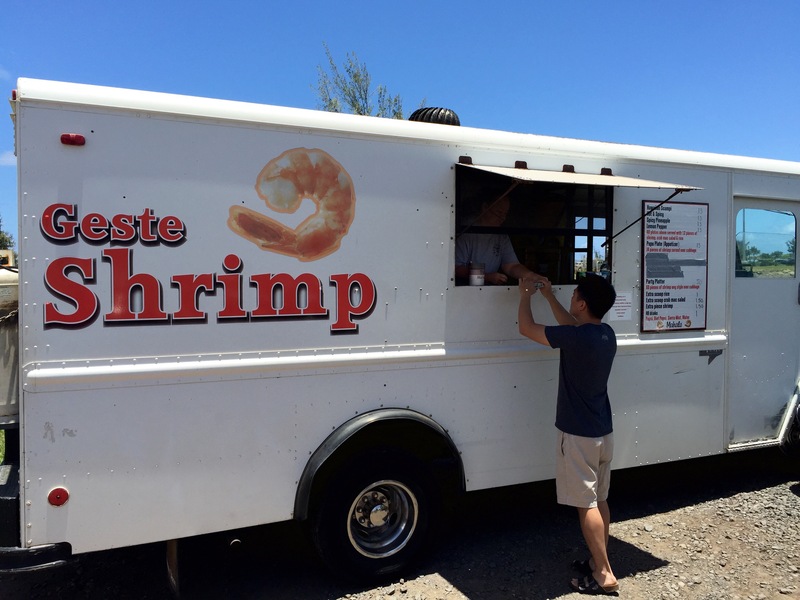 Geste Shrimp earns a nearly perfect rating of 89 out of 90 lost shrimp tails, darn near worth the price of a plane ticket to Maui just to try their food. You will never experience shrimp like this anywhere else, and neither will the upholstery of your car. 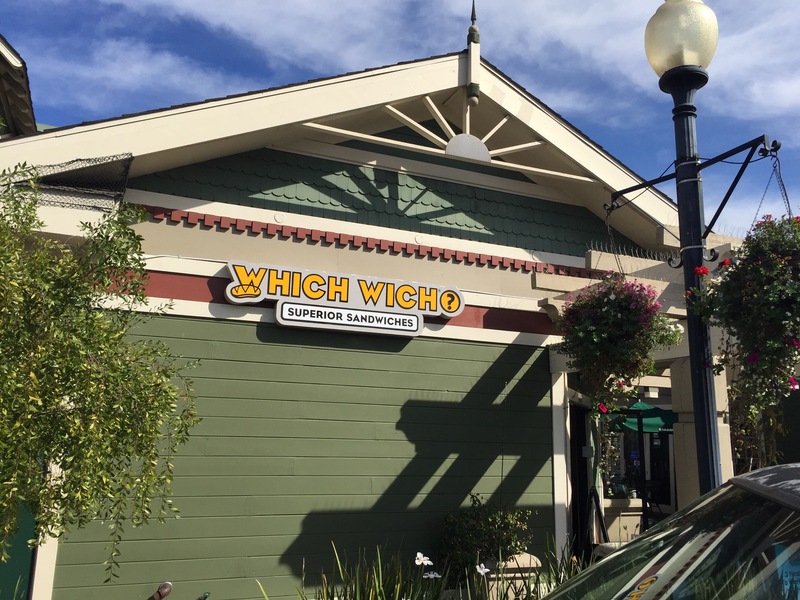 Which Wich is a worldwide sandwich shop chain that I had never heard of before a few days ago. You can’t really do a restaurant review on an entire chain, so I’m posting this as a Small Bite instead. Hey, a new sandwich shop! New for me anyway. I found myself in Belmont at lunchtime following a dentist appointment, so I decided to go looking around for somewhere I hadn’t eaten at before. Which Wich immediately caught my eye, mostly because it is located right next to the Starbucks I was visiting. Alright, let’s give this a try. Never before have I seen a bag caddy of this magnitude. 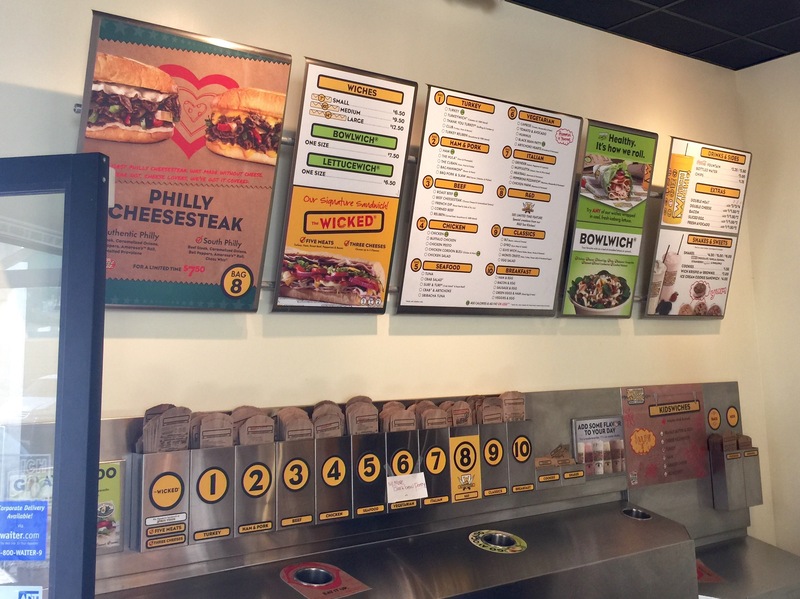 The ordering system at Which Wich is… different. I honestly do not know whether I love it or hate it. I think love. Basically there is a wall of many types of little baggies. You select a baggy based on the type of sandwich you want to order (I opted for a Cuban in the ‘ham and pork’ category) and fill in some options with a felt pen. 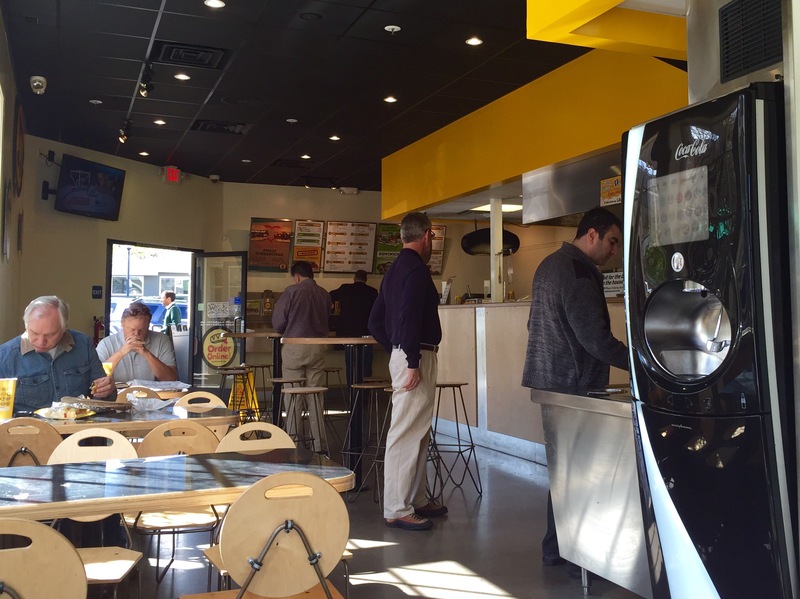 It’s not immediately apparent what you’re supposed to do when you walk in, but Which Wich seems aware of this. The cashier also has the job of asking every single person who walks in if they have been there before, and if not they are given a brief rundown of what to do. They have one of those awesome a-billion-soft-drinks-in-one-machine things here. The one thing that stood out about this place was the swarm of flies buzzing around inside the front door. I’m not kidding about this. They were the annoying fly-around-in-a-square-pattern type flies that never land, and they exclusively hung out in a beam of sunlight through the open doorway. I guess it wasn’t really unsanitary since the flies weren’t landing on anything, but it was still weird. I know it was a nice sunny day and all, but close the freaking doors, people. This is a restaurant, not Wild Kingdom. The slightly pouty teenager making my sandwich called out “Cuban for Tom! Cuban sandwich for Tom!” Oh nice, that’s me. So I walked up to the counter. “Just a minute,” she said sulkily, as though I had asked her to get off the phone and go do her chores. And so I waited another few minutes, standing there awkwardly. “Cuban for Tom!” she called out again. Apparently she meant it this time because I was awarded a sandwich. Alrighty then. 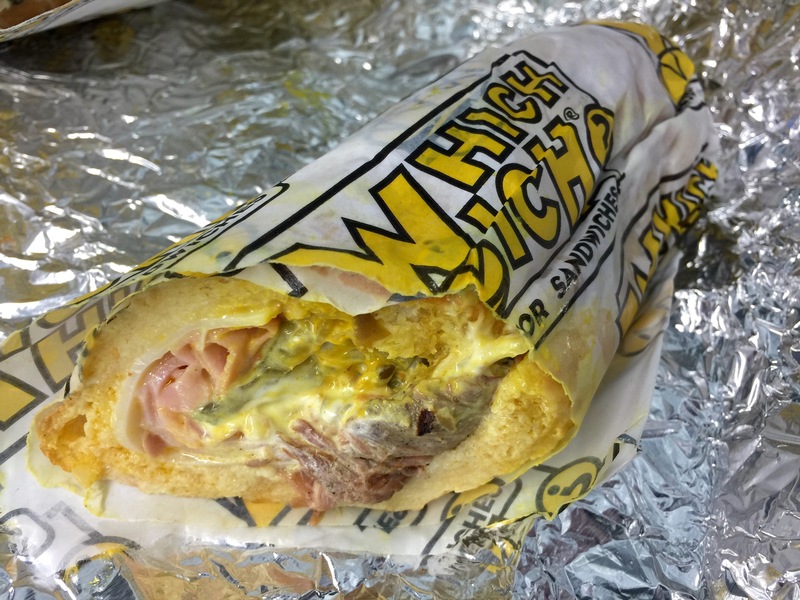 Which wich would a witch witch if a witch could witch a wich? The sandwich itself was pretty tasty. It was messy as hell, although that’s not always a bad sign. It was a real challenge to keep drippy toppings off of my clothes, but somehow I managed. I rather appreciated the copious amount of mayonnaise that was used, but my waistline didn’t feel too great about it. Overall Which Wich is not a bad place for lunch. I’d probably prefer it over Subway, but it’s more or less on par with Togo’s. No sandwiches were harmed in the writing of this post. Actually, that’s a lie. I totally destroyed that sandwich, and I’d do it again given the opportunity. I’m not entirely sure why a disclaimer is needed to advocate sandwich safety, but I guess there’s a first for everything. Why am I still writing this? Why are you still reading this? These are questions the answers to which may never be known.